All transactions are safe and secure with a reliable history in online purchasing behind each of our associates. 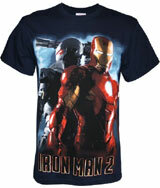 Buy the Iron Man 2 Movie Poster t-shirt to own Iron Man clothing and merchandise. The front of this Marvel Iron Man 2 movie tee displays the movie poster art for the sequel, featuring an image of Tony Stark and War Machine standing back to back. The duo makes the perfect team to take on Whiplash and Justin Hammer. Blue clouds fill the background with the movie logo shown at the bottom. This provides an attractive backdrop for the main character, whose Arc Reactor glows brightly in his chest. Wear this shirt with a great looking party favor Iron Man mask or costume mask. In addition to the Iron Man 2 Movie Poster tee above, browse the Iron Man Clothing Gallery for more apparel like men's and women's clothes, kids shirts or hoodies.